Every day I amazed by our boys. Sometimes it could be because of something they do, and other days it might just be from looking at them and realizing how proud I am of the young men they are becoming. Recently, Blake has been working really hard on his Eagle project. This week he mailed out his fundraising letters. I am proud of him for deciding on a project that is important to him. Last month Blake's Troop held their Court of Honor (awards ceremony). Blake was awarded his merit badges and also recognized for earning his Life Scout advancement. He presented me with my mother's pin for Life Scout. When I had my pictures printed, I couldn't wait to scrap them. I know my next mother's pin will be even more special. For this layout, I used my March Studio Calico kit - Story Hour. I added some Studio Calico alphas and kraft stars that weren't included in the kit. 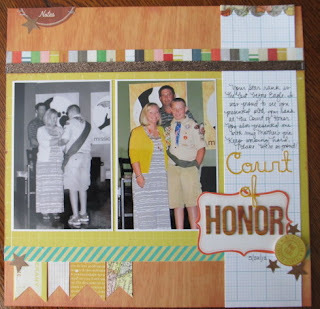 My layout was inspired by a page by Megan Hoeppner in Creating Keepsakes' new idea book Simple Scrapbooks. With Blake's Eagle project in sight, I realize I need to get caught up on scrapping his other scouting memories! Time is sure flying by.